I love it! What a fabulous birthday cake and gift! Awesome! But it’s weird, I mean, imagine eating Michael’s face or something. That theme is definitely BIRTHDAY. Was it mint chocolate chip, or a month early? 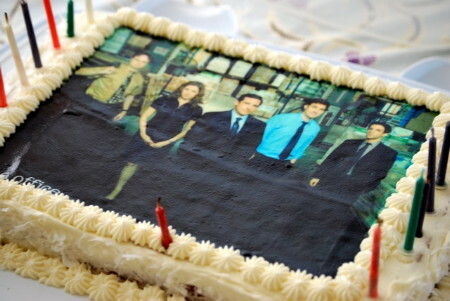 I love how the candles were placed around the outside of the cake, so not to destroy the awesomeness of it. There is always a theme! Did you pick the hour nap? Awesome! Photo cakes are truly the best. 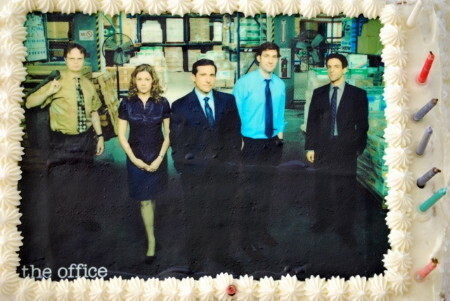 To #3 Luisa- I had an edible Steve Carell picture put on my graduation cake this past May and his face is still in my freezer because I couldn’t bear to eat it. LOL It is a nice surprise every time I open the freezer though. One word: Awesome!… And Happy Birthday! Wow, what an awesome and delicious looking cake! Thanks for sharing and Happy Birthday, anonymous Tallyhead. Best Birthday Ever!!! Love it!